I was not expecting Tangelo. I ordered ‘Lenape’ and ‘Gaiety’ from a dealer on eBay. It turns out I received ‘Tangelo’ and ‘Cleopatra’. I was very disappointed at first, but Tangelo has its good points. It is very cute and small with darker green leaves and copper orange flowers. The bloom stems and seed pods are purple. 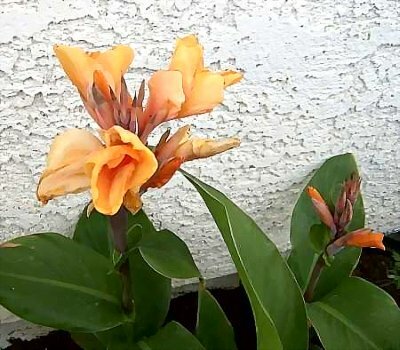 This entry was posted on Monday, July 21st, 2008 at 8:58 pm	and is filed under C. 'Tangelo', Canna, Flowers. You can follow any responses to this entry through the RSS 2.0 feed. You can leave a response, or trackback from your own site.